Malachi is a Biblical minor prophet best known for writing the last book in the canon of the Old Testament Scripture. It was written in the 5th century before Christ. These last words were followed by 400 years of silence before the advent of Jesus Christ and the New Testament. In the Bible verse below the reference to Elijah is a prophecy of the coming of John the Baptist, the forerunner heralding the coming Messiah. Christ himself identified John as a fulfillment of this prophecy (Matthew 11:14). Isn’t it strange though that in this context there is a comment about fathers and their children? Malachi is predicting that after 400 years of silence, God would usher in the Messiah with a bold prophecy and the tender turning hearts of fathers and children. All of this was to transpire before that “terrible day of the Lord” when the Messiah would be raised up and murdered and, as Christ predicted, a disobedient Jewish generation would see their beloved temple and city destroyed by a beastly Roman nation (AD 70). There is something profound here for all. The special, ordained relationship of fathers and children is called out as a sign of the re-emergence of the God of Israel and his plan for the redemption of mankind. In addition to the coming Elijah-like prophet, John the Baptist, fathers and children will be softly drawn to each other once again, as they were designed and created. As the father goes spiritually, so goes the family. If we check out spiritually or fail to grow in faith and depth of relationship with the heavenly Father, we will miss some degree of substance we’re designed to pass down. When we are spiritually mature leaders of our family we bless and guide our children as God does with us. When we don’t step into this God-given role an opportunity is missed and the family suffers. Yes, our children need our hearts, our prayers and attention. As our own hearts turn to our children, committing them in humble prayer to our heavenly Good Father, may their own hearts be touched and blessed. It’s a serious responsibility; it’s how God intended it to be. 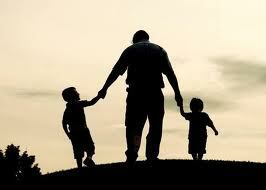 Fathers, love your children; children, love your fathers. The good Father knows best.